Carrier bags are a big blemish on the planets eco system; causing health problems for wild life in the ocean, making a mess on land. In the UK, supermarkets hand out 7.9 billion carrier bags a year. So whenever we come across a resourceful project that finds a way to put all those throw away discarded carrier bags to practical use we’re pretty happy. 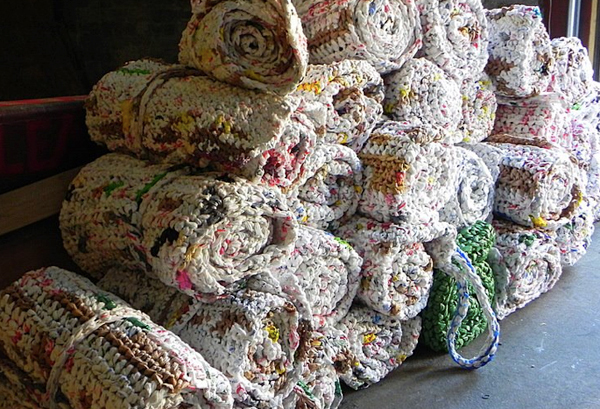 In California, Alabama, Kentucky, Chicago, Arkansa, and other states across the US, groups and individuals have started to crochet single-use plastic bags into sleeping matts for homeless people providing a little more comfort for those cold hard nights. Creators of these ingenius items have called the material Plarn. And Plarn makes for some good looking matts! This idea hasn’t yet had much uptake in the UK, so any community-, friendship-, whoever-else groups, that are looking for a new rewarding project, look no further! People without homes who can croquet, croquet away and if you get the chance pass the skill onto someone else who might benefit. Whilst we would advocate homes, shelter and beds for homeless people, the rise of homelessness in the UK can’t be ignored. This is great practical tool for anyone who does find themselves sleeping on the streets. Let us know if you, a group or shelter you’re involved with is interested in making matts for homeless people. If you already are, don’t forget to share the skill! If you’re affected by homelessness in the UK St Mungo’s and Shelter are both useful places to contact. Hi Charlotte – where are you based? A lifestyle blog bringing you fashion, music, food, and everything else that's just nice about Bristol and beyond! Keep it real. Puck flastic.